I wonder how many of my readers are as tired as I of not having the family fun of musical comedy variety shows that used to be such a television treat in years gone by. Now we are saddled with hundreds of channels we don’t want just in order to have access to the few we care about. How’s that working for you? And nowhere in that sea of so-called “entertainment,” can we find the innocent pleasures once available from programs like “The Carol Burnett Show.” Well I am happy to report that thanks to the efforts of producers Carolyn and Steven Wong, there is relief on the way from the talented Stage Right Players of Conroe’s elegant Crighton Theatre. Through special arrangement with Contemporary Drama Services & The Carol Burnett Show Company, Stage Right was granted permission to present this adaptation of the show created by Ms. Wong and director, Sam Martinez. 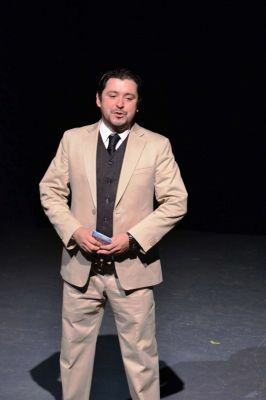 In his preface to the printed program, Martinez promises, “…scenes that should seem familiar, but are also brand new.” Longtime fans of The Carol Burnett Show will probably agree that he and his cast have delivered on that promise even though Miss Burnett herself is not part of the show. 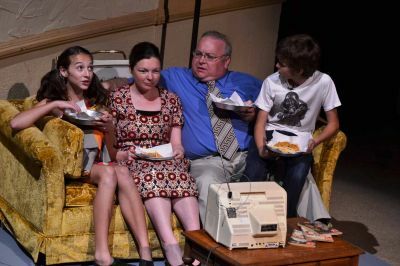 First we meet a typical “70’s Family” as mom, dad and the kids (Tom & Amy Lockhart, Mac and Sally Johnson) gather ’round the TV to watch — you guessed it! — The Carol Burnett Show. 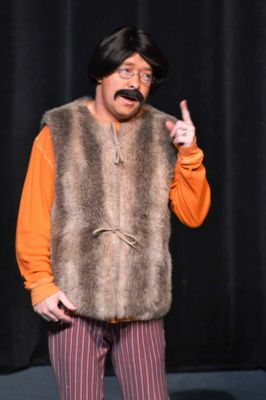 The format that follows is basically a series of musical numbers and humorous sketches based on the classic skits old-timers will recall from the original show. Things got off to a sensational start as Yvonne Nelson led the company in a marvelous tribute to Ethel Merman with, “There’s No Business Like Show Business.” Ms. Nelson lights up the room with her radiant energy and soaring voice that really captures the Merman essence. 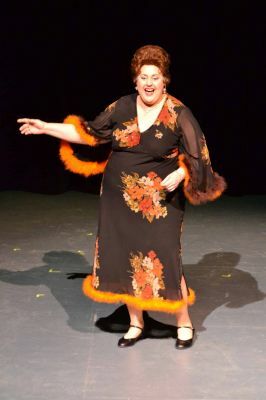 Crighton regulars may recall her spectacular Sophie Tucker routine when she performed “Some of These Days” in Crighton’s wonderful 2009 Vaudeville show, brilliantly written and directed by the late Glen Lambert. I hope there will be more Vaudeville in the Crighton future. Raabe as they performed “I Got You Babe” in a riotous Sonny & Cher spoof as Sunny & Claire. It was hilarious! 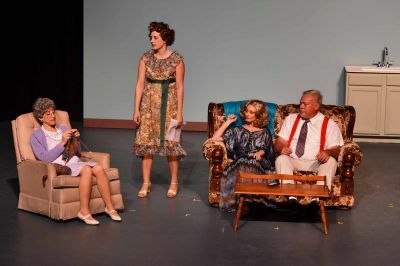 Marcia Feldt Bates and Will Radcliffe kept the laughter going as the jealous wife and vain husband that make up an unattractive elderly couple in “Passion on 10thAvenue.” Cathleen Reagan and Katie Kelly join them in the fun. Jim King and Tom Richard joined Reagan, Bates, and Wong in a spoof of “Guess Who’s Coming to Dinner” that seemed a bit overlong. Relief came quickly with the great duet of “You’re the Top” from Nelson and Zaritski. 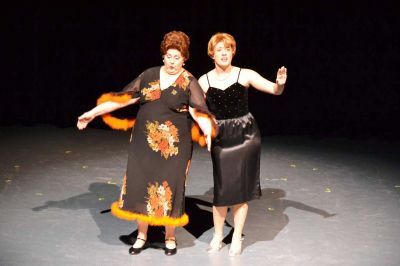 Nelson would return in Act Two to lead the tap dancing quartet of Beverly Blair, Lorraine Counts, Angela Graves and Lynn Winkler in an “I Got Rhythm” that sparkled as much as the glitzy costume designs of Kathleen Zaritski. In the “Prison Nudge” sketch, Kentimenos is such an annoying wife that her imprisoned husband (Mr. King) would rather stay on Death Row. Radcliffe plays the Warden. Act One would close (And Act two would open) with soap opera spoofs titled, “As the Stomach Turns,” and Mr. Raabe as Gaylord sports “a hat to die for.” Wong brings plenty of physical lunacy to a Guys & Dolls spoof of “Take Back Your Mink” with Blair, Counts, Graves and Winkler returning for more tap dance fun. For still more hilarity there was “The Howl and the Pussycat” with Raabe uproarious as a man with cat-like instincts. Next up, as though sensing the audience would need relief from laughing so much, we have the not very funny Rent-A-Car sketch. The less said about that the better. As the end drew near the cast tackled what must be the favorite all-time Burnett Show skit: The take-off on Gone With the Wind, re-titled here as Went With the Wind. If it was the show’s greatest challenge it was also its greatest success. 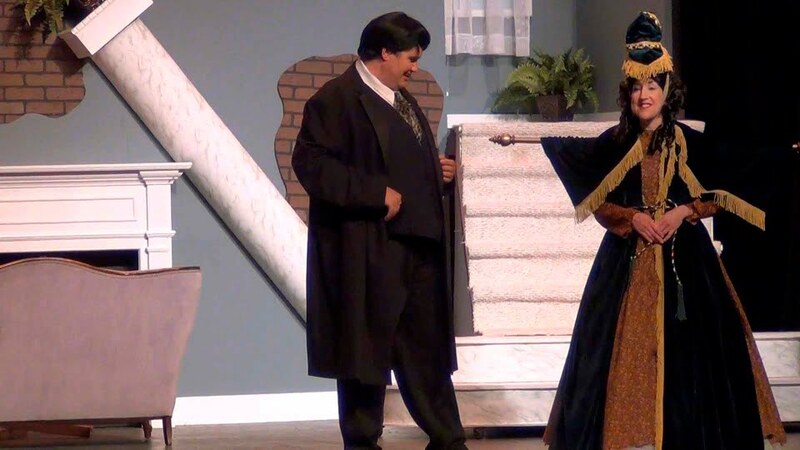 THE CAROL BURNETT SHOW continues through May 6th at Conroe’s Crighton Theatre with performances tonight & Saturday at 8 pm and a 2 pm matinee on Sunday. 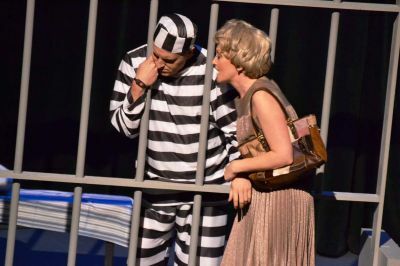 For tickets and information call 936-441-7469 or visit the website at www.crightontheatre.org . 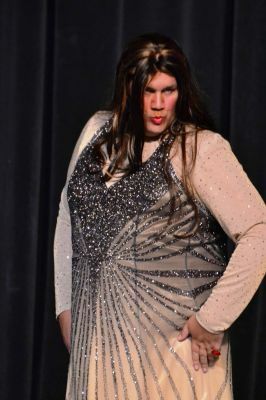 This entry was posted in Comedy Clubs, Houston Community Newspaers online, Miscellaneous Reviews, The Courier Columns, Theater Reviews, ThePeoplesCritic.com and tagged Carol Burnett Show, Celebrities, comedy, Conroe, Crighton Theatre, Entertainment, plays, Reviews, Texas, theatre. Bookmark the permalink.